Chairman "Hilton Lee" poses with Thai Prime Minister Yingluck Shinawatra at Lotte Hotel in downtown Seoul on March 26, 2012. There is a Korean proverb "Clothes are wings for men." 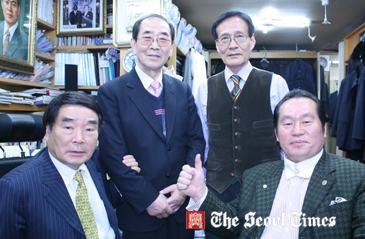 There is a famous tailor in the small global village of Seoul's Itaewon who puts wings to the foreign diplomats. 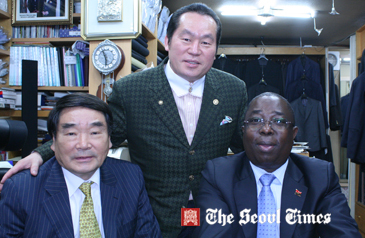 Dubbed as "Hilton Lee" or "Suit Doctor" by his diplomatic friends, master tailor Lee Duk-No has been making suits for top foreign envoys in Seoul for nearly three decades now. 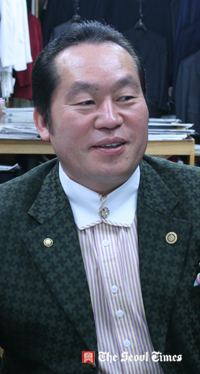 Presently, he is the chairman of "Hilton Lee Corp.," which owns four tailor shops in Itaewon and a factory. He is called "Hilton Lee," his affectionate nickname being coined by his foreign friends. What makes "Hilton Lee" so special is that world famous celebrities, kings and heads of states keep visiting his shop as his regular customers. The Seoul Times has recently met him in his office to find out his secrets to making friends with celebrities from around the world and how he became probably the "world's most famous tailor." The followng is the full text of his interview. Q1: Chairman Lee! First of all, We would like to thank you for this interview time in spite of your hectic schedule. You spent decades serving your customers as probably the most famous tailor in the nation. Are there any special reasons? What made you spend your life for this profession? A1: Actually, as a very young man I plunged myself to this line of business just because I heard that I could make decent money. Also, I have loved art and design from my early days. While working as a tailor here in Itaewon, I was able to hobnob with a number of foreign celebrities as well as top foreign envoys. Now I am really proud that I can serve them all with my skills and ability. I feel like I am putting wings to diplomats' shoulder by making specially tailored suits for them. I always wish that they can fly farther with the wings I make for them. 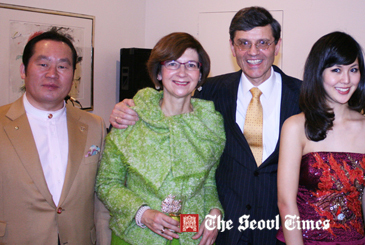 Chairman "Hilton Lee" (left) poses with German Ambassador Hans-Ulrich Seidt (3rd from left), and Mrs. Marita Seidt (2nd from left) at the German envoy's residence in Seoul's Seongbuk-dong. Q2: Even though your products are custom-made or hand-made, I have heard that prices are still not as expensive as they think. How do you maintain the relatively reasonable prices? What are the differences and competative edge of yours compared with other places? What are your secrets for that? A2: An average fashion brand costs 3 or 4 million won. Considering the quality of our products, our customers should pay even more, I believe. But our prices for a top-of-the-line suit do not exceed 1 million won. Prices for more reasonable ones range from 500,000 won to 700,000 won. We use the top quality textiles and the way we make our suits are more professional and better than any other tailor's shop that I am aware of. 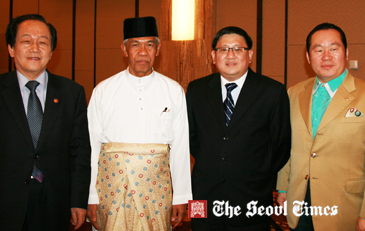 Chairman Lee Deok-No (right) of Hilton Corp. & Tailor Co. poses with Brunei Ambassador to South Korea, Dato Haji Harun Ismail (2nd from left), Minister Suh Kyu-Yong (left) of South Korea's Ministry of Food, Agriculture, Forestry, and Fisheries, and with Singapore Ambassador Peter Tan Hai Chuan (陈海泉). Our stitches are very strong, which make our suits last very long. We also use the best zippers and extra buttons just in case they lose some. On top of that, if our users gain weight they can simply enlarge their suit. There are many other elements which make our suits the best in the nation, that's why our customers keep visiting me from all over the world. famous people keep coming to your place? A3: My reputation as a master tailor has been accumulated through nearly three dacades. Former president of the International Olympic Committee (IOC) Juan Antonio Samaranch, US track and field star of 1988 Seoul Summer Olympics Carl Lewis, the late Italian tenor Luciano Pavarotti, US basketball star Magic Johnson, and US action film star Steven Seagal, have visited my shop in Itaewon. You name it. Chairman Lee Deok-No (right) poses with Philippine Ambassador Luis T. Cruz in a diplomatic event in Seoul. Also, numerous heads of state and kings from all over the world have been visiting me in my shop. Of course, scores of foreign ambassadors serving in Seoul are my frequent customers for the last 35 years. I treat them as my friend as well as my customer. When I make them the best possible suit, I consider their nationality, cultural differences, individual tastes, profession, and so forth. In particular, I take into primary consideration their bodily feature, making them look better in my suit. They even call me "suit doctor." Before I meet with top VIP customers, I study hard about them and their country to make them feel comfortable talking with them later. They say that I am "more of a diplomat than a tailor." 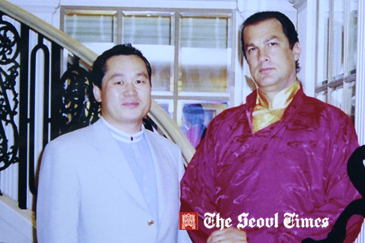 Chairman "Hilton Lee" poses with American action film star Steven Seagal, who he befriended long time ago. Q4: Is there an special episode regarding your dealings with a particular celebrity? A4: When Luciano Pavarotti visited me I was surprised by the massive size of his waist. I'd never seen such a big and huge person in my life. He told me that I am "suit doctor." He wanted me to make him look slim in my suit. I was at a loss back then. When Pavarotti appeared on stage, his friends praised him for "losing weight." He told me later that he was really happy about the compliment that he looked slimer than before. He became my regulars. I still keep the checks he gave me. Q5: When did you start this profession and on what occasion? We believe that there were some ups and downs or difficulties in your business before you became so successful now. 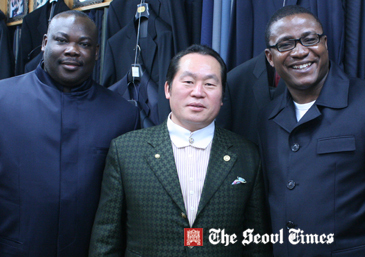 Chairman "Hilton Lee" (right) in upper row poses with Minister Counsellor Bonaventure Adjavor (right), senior TV actor Kim Sang-Soon (left) in his shop in Seoul's Itaewon. A5: After discharging from the military service I was looking for a job. I heard that being a tailor in Itaewon was quite lucrative. I was employed as an assistant at a tailor shop in the area. I worked like a horse. From dawn to dusk I did my best, earning trust from the owner. He offered me a salary several times larger than others. That's how I entered this profession. Regarding the difficulties, I do not think I faced any major problems or difficulties in my business. I always maintain a postive way of thinking and attitude. I am an workaholic, but I enjoy my work. I never close my shop. It is open all year round. I wake up early in the morning and I usually go mountain hiking around 5:10 in the morning. I never sleep more than three hours per day. Chairman "Hilton Lee" (right) poses with senior TV actor Kim Sang-Soon (left in lower row), and with his staff. Left in upper row is Managing Director Moon Jae-Kwan in his Itaewon office and to his right is Mr. Kim Young-Gul is Hilton's senior designer. Q6: Do you have any plans to expand your business in the future? A6: My friends keep telling me to franchise my business or to open brach shops in other areas, but, I do not agree with them. I take great pride and pleasure in having face to face encounters with my customers who come from other countries. I do not want to discourage customers who are my friends. to making more money. I am quite satisfied now. Q7: You are quite active with social works as well. Currently, you are serving president of the Korea Cooperative of Custom Tailors, advisor of the National Unification Advisory Council, chairman of "Rotary International District 3650." What other social work do you do? Have you been asked to run for any elected positions? 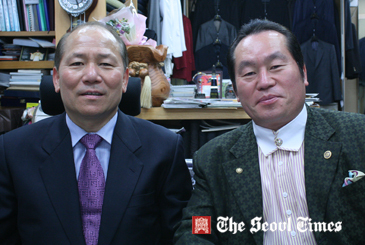 Chairman "Hilton Lee" (right) poses with Executive Director Yoo Nak-Yeol of Korea Cooperative of Custom Tailors in his office. A7: To tell the truth, I am serving as chairman or representaitve of 18 social organizations, but I do not want to become a politician. I hate some natures of being a politician. Politicians are and should be cameleons, I mean that sometimes they have to maintain a poker face. I hate lying. But, I do believe in the social obligations of the people in leadership position, so called "noblesse oblige." I do practice what I can do for the social duty. I have supported medical operations for the needy folks in Nepal, the Philipphines, and in the United States. I regularly provide the families of the North Korean refugees in our country. I also support scholarship funds for the middle and high school students. 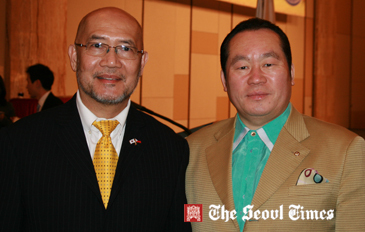 Chairman Lee Deok-No (left) of Hilton Corp. & Tailor Co. poses with Singapore Ambassador Peter Tan Hai Chuan (陈海泉). Q8: You are called "civilian diplomat" in the diplomatic community in Seoul. How do you rub shoulders with members of the diplomatic corps? A8: Even after they finish their tenure and go back to their countries, they still visit me. They order suits from overseas. Three months ago, I received a buisiness order of 50 pairs of suits from a diplomatic friend based in Washington DC. Even a diplomatic friend of mine asked me to order 50 units of "Chairman" passenger cars for him. It seemd that he trusted me. It looks like many other foreigners keep visiting me from overseas via "word of mouth." I am really thankful to them for promoting me and my shop. Chairman "Hilton Lee" (center) poses with Angolan Charge d'affairs Alfredo Dombe (right), and with a senior S. Korean TV actor Kim Sang-Soon in his office in Seoul's Itaewon area. Q9: Aside from your profession and friendship with foreigners, what other areas interest you? What are some of your hobbies? I heard that you are a good singer. A9: When I was a middle school student I placed second at the abacus calculation contest held in North and South Chungcheong Provice. A bank wanted to hire me when I grew up later. When I was a senior of Dongducheon High School, I was chosen as the middle-class champion of the National Body Building Championship's high school division. I worked out a lot. Chairman "Hilton Lee" (center) poses with Minister Counsellor Bonaventure Adjavor (left) who came to Seoul from his Embassy of Republic of Ghana in Tokyo. He visited Lee's shop with a friend. I also practice many kinds of martical arts. I am the 6th dan (level) of Taekwondo, and 3rd dan of Akihito. I also practiced kungfu and boxing. In the morning I still do 550 sit-ups and 300 push-ups. I was born in 1953. At gatherings I enjoy singing and dancing for other people. They call me an "entertainer." Q10: Lastly, I would like to inquire about your family. What do they do for a living? A10: I have six brothers and sisters. I'm the second oldest one in my family. My older brother, who studied at Cornell University in the US, is serving as a professor of Chungwoon University. He is married and has two sons. One of my sons is studying in America and the other is attending Yonsei University in Seoul.